I refuse to let our children determine the design plan for our home. I truly believe that you can have a beautiful home that you love and still have a practical space that allows kids to be kids. I also love to entertain (over the weekend we had three different house guests spend the night in three days). I always want our guests and our family to feel welcome and not worried about ruining anything-- but my version of that doesn't mean I have to have crappy furniture and nothing nice. That being said, I know I told you I wanted a patterned sofa. I would still love one. That would be both beautiful and practical with kids. But then I found this Sunbrella Indoor/Outdoor apple green velvet. It's on sale. Big time. I ordered samples of the light grey, teal, and apple green. Holy smokes my friends, the colors are gorgeous. I decided to cover our yellow sofa in the apple green velvet. I'm not gonna lie. I'm beyond excited. Because it's an outdoor fabric from a great brand, the kids can't ruin it and I get the style that I'm looking for. Style, with kids, just takes a bit more effort but it's not impossible. You what's crazy? In September 27th of 2010 I wrote a whole post on our family blog about how I dreamed of owning a velvet green sofa and starting a design blog. This is actually my 500th post!!! UPDATE: CLICK HERE TO SEE OUR GREEN VELVET SOFA. Here's some beautiful velvet eye-candy for your day. Thank you so much for reading! I appreciate you all so much. My girl, Megan, from Honey We're Home started a new fitness blog and it went live today. She's so darn inspiring I may even get my booty outside to work out. You can visit her here! Love that color green. Is the velvet soft? I know that indoor/outdoor fabric can sometimes be very stiff. I ordered some samples and they felt very plasticky. I have 3 kids and 2 dogs, so I am looking for something that will clean easily. Argh! I'm so jealous! That is going to be beautiful! Can't wait to see. I'm on the hunt for some navy velvet fabric.. do you think they have any? Thank you for sharing all these rooms featuring green couches. I have a sage green couch I am trying to work with and I loved seeing these rooms! Love the color and all the photos! I'm so with you nothing makes me cringe more then when I read blog comments that people won't do certain things to make their space beautiful because they have children. Can't wait to see what you come up with!! *GASP*! I love what you picked and you know it's going to be kid friendly, too! Double love! And that is definitely some eye candy...green is always a favorite of mine, too...can't wait to see it in all it's green glory! Ooh, that looks lush. I don't even get to have velvet cushions for texture because my hubby can't stand to touch it. Velvet, velveteen, corduroy - it's like nails on a chalkboard to his skin. In other news, I feel like I've been seeing a lot of people pick outdoor fabrics for major furnishings in cloth. If I didn't like you, I'd have to not like you. I am so jealous (I hate that word, but I must admit to it over this), so jealous of your soon to be green velvet sofa. But, yes, I'm happy for you, and it's going to be incredible!! Oh wow, that's going to be greatness! 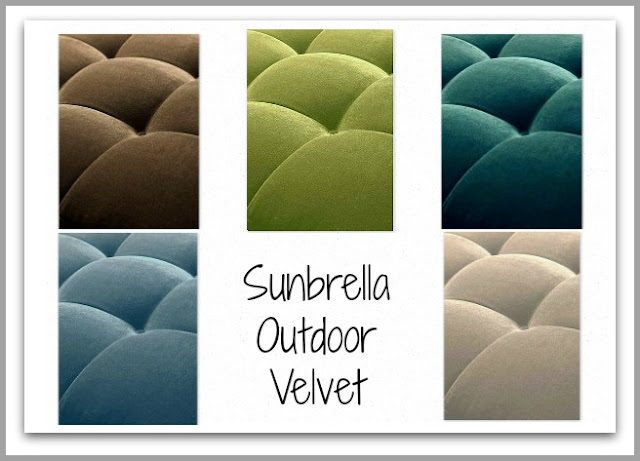 I didn't have a clue Sunbrella made velvet. Super fun find, Abby. Can't wait to see it. Love that you linked to your article from two years ago, which linked to Julie's article about her home being her portfolio. This is right where I'm at! And I love the green and can't wait to see the finished product! !